dawn m rahme - Phillips Murrah P.C. Today, March 8, 2019, is International Women’s Day. Phillips Murrah would like to take this opportunity to acknowledge the achievements and importance of women leaders in the workplace. The theme of this year’s IWD is gender balance, and Phillips Murrah is doing our part to help realize this important societal goal. 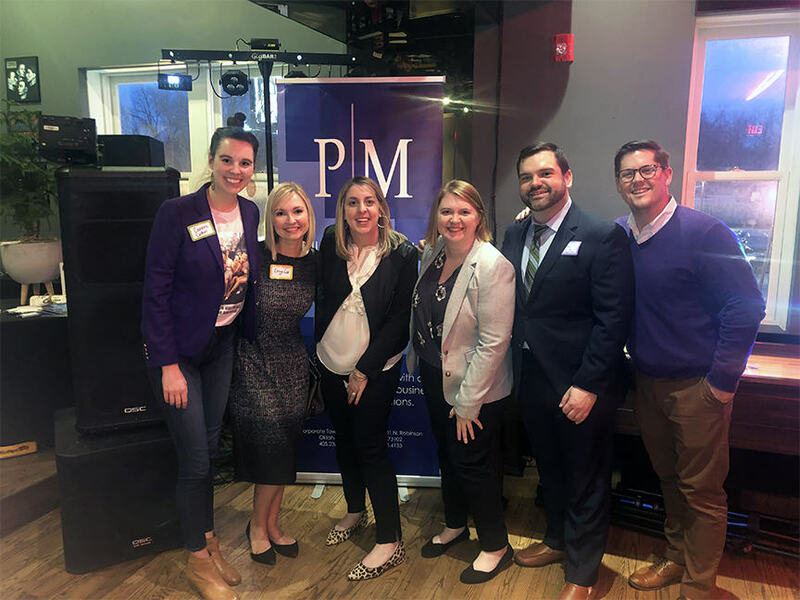 We are proud to have sponsored the OKC International Women’s Day Celebration last night, hosted by Oklahoma Women’s Coalition, held at Ponyboy. This event was the second annual celebration of International Women’s Day in Oklahoma City. 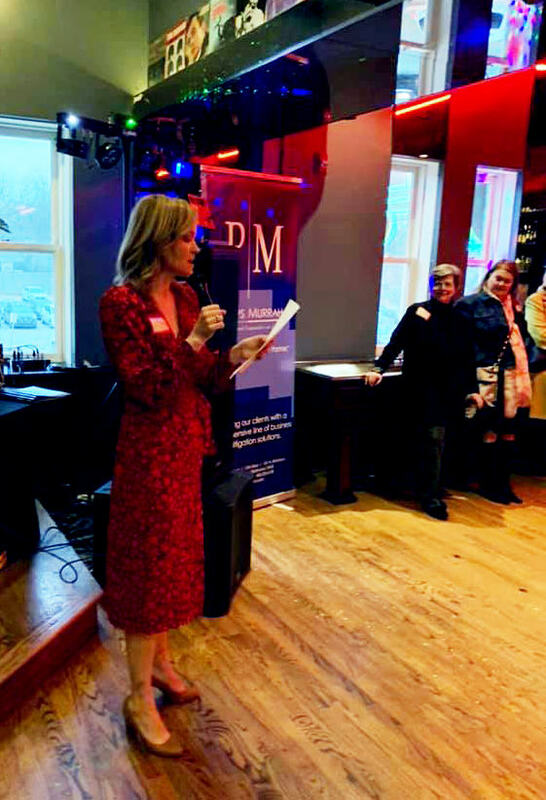 “57 attendees joined to network and learn more from women’s organizations, such as Oklahoma Women’s Coalition, YWCA, ReMerge of Oklahoma County, Sally’s List, the Metisse Group and more,” said Caroline Cotton, co-creator of the International Women’s Day OKC celebration. From left: Caroline Cotton, Lacey Lett, Dawn Rahme, Melissa Gardner, Sam Newton and James Linhardt. 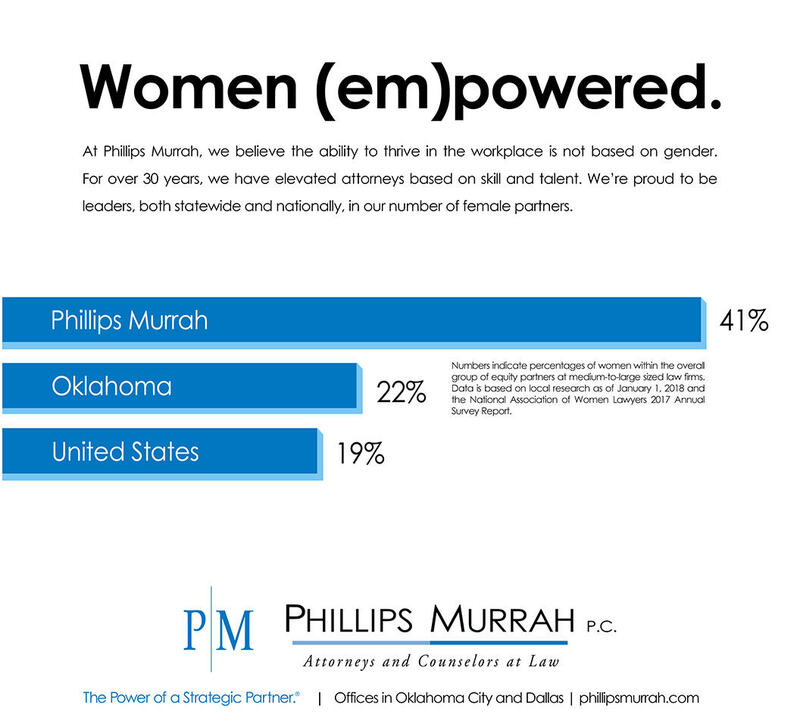 Phillips Murrah is proud to be leaders in the area of promoting women into positions of leadership and equity within our Firm. Our comparatively high percentage of women shareholders and executive leaders is a manifestation of our corporate culture, which celebrates talent, skill, character and collegiality. All attorneys at Phillips Murrah are expected to meet high standards of professional ability and interpersonal intelligence. Additionally, our workplace expectation is that each attorney is able to thrive in his or her practice, unencumbered by underlying considerations about individual characteristics unrelated to the practice of law. Phillips Murrah’s high percentage number of women partners and leaders isn’t motivated by societal pressure. Rather, it has occurred in an authentic way due to our inclusive corporate culture, and can be seen as an accomplishment for everyone at the Firm. Phillips Murrah is also a proud Sustaining Partner of the National Association of Women Lawyers (NAWL). We are pleased to be able to support NAWL’s mission, which is to provide leadership, a collective voice and essential resources to advance women in the legal profession, and to advocate for the equality of women under the law. We are proud of the many strengths and advantages that women leaders bring to our Firm and to society in general, and we are happy to help celebrate this each day – and especially on International Women’s Day! 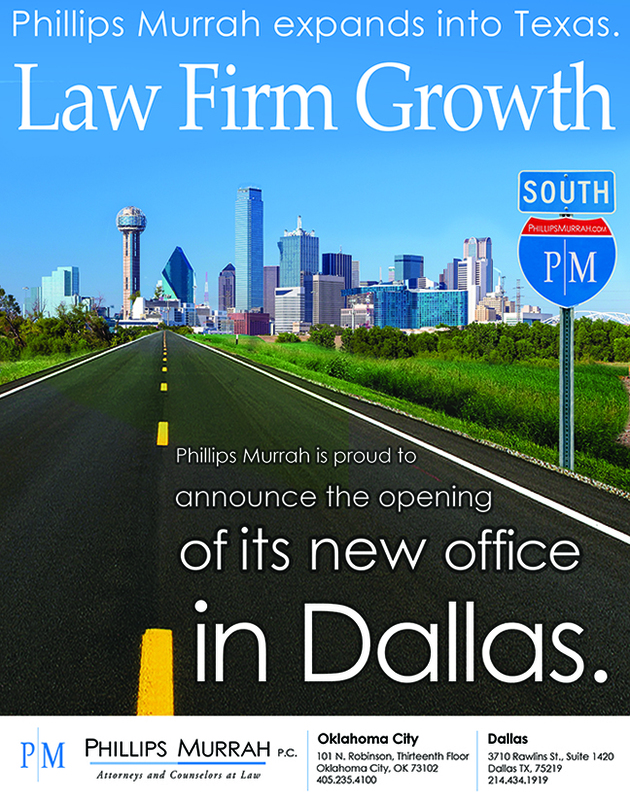 Oklahoma City-based law firm Phillips Murrah announces it has opened an office in Dallas with the addition of new Director Mark Golman to the Firm. Golman, who is leading the expansion efforts south of the Red River, focuses his practice on the purchase and sale of businesses and assets, the negotiation of long-term supply agreements and financing arrangements, corporate counseling, and bankruptcy and insolvency-related matters. 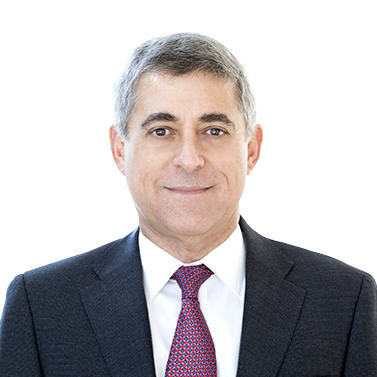 Golman, a partner at Strasburger & Price for the prior 20 years, joined Phillips Murrah at the time of his prior firm’s recent merger with a national firm. His background includes serving as lateral hiring partner for 18 years and intermittently as CMO at his previous firm, skills that he brings to the new Dallas office as Phillips Murrah seeks to grow through lateral additions in litigation, employment and real estate. His joining Phillips Murrah was preceded by a decade-long working relationship through a common membership in ALFA International. Determining factors in Phillips Murrah’s decision to enter the Dallas legal market include Golman’s joining the firm as well as proximity of the two markets and existing client relationships. The Journal Record will honor Phillips Murrah directors Sally A. Hasenfratz, Dawn M. Rahme, and attorney Mary Holloway Richard as those named on the 2016 Fifty Making A Difference list. Judge Jane P. Wiseman will be the keynote speaker at the 2016 Journal Record Woman of the Year gala set for Nov. 2 at the National Cowboy & Western Heritage Museum. The Fifty Making A Difference list spotlights female business and community leaders, and honorees are chosen from nominations received across the state. Dawn M. Rahme represents individuals and businesses in an array of transactional matters. The Phillips Murrah Board of Directors has elected Director Dawn M. Rahme to the Firm’s Executive Committee. Rahme previously served as a Practice Group Leader for the Firm’s Transactional Practice Group. Rahme represents individuals and businesses in an array of transactional matters focusing on assisting corporations, partnerships and individuals in general tax planning.